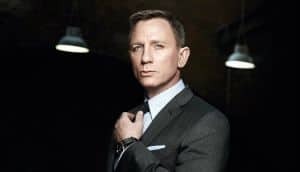 Bond 25 is Daniel Craig's Next Project | Nerd Much? Daniel Craig’s relationship with the Bond series appears to be complicated. The star has portrayed the iconic character in four films now. But the actor has previously stated that he wasn’t too keen to take on the Bond mantle again. But 2015 was so long ago now. People change. Opinions change. And apparently Craig’s has. That, or he’s poised to get a massive payday which brought him back to the franchise. Craig was interviewed briefly by the Associated Press during the Opportunity Network’s charity auction this week. There, Craig was auctioning off his personal Aston Martin which resembles a model seen in the Bond films Goldfinger and Skyfall. It was there that he confirmed that Bond 25 was next on his to do list. “We are working on a script right now. And it all depends on that, really. I am working on a Richard Curtis script at the moment. We hope to start shooting that in six or seven weeks. Then Bond would be right at the end of the year. But we are working on them both right now. After the quotes ran, MGM remained mum on Boyle’s involvement. And so too was Craig at this week’s auction. “We’ll see, we’ll see,” was all he said regarding Boyle being aboard the project. Regardless who signs on as director, the movie looks like it’s ready to move right along. Bond 25 has a release date slated for November 8, 2019.